Planting up containers and pots for the winter calls for a little forethought and preparation. Firstly you need frost-proof clay, wood or stone containers. No good having a pot crack because it freezes so make sure they have good drainage. 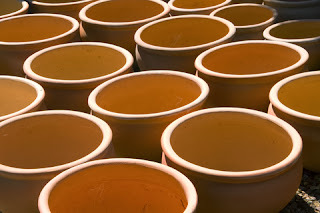 Put some pieces of broken clay pot in the bottom before adding the compost and stand the containers on bricks, clay feet or bits of tile to let them drain freely. Using a free-draining mixture such as John Innes No.1 or No.2 compost will be beneficial, adding some fertilizer/blood fish and bone meal when you plant them up. Plant up bulbs: daffodils, crocus and muscari, bushy evergreens, wallflowers, winter pansies. Apply bone meal to herbaceous borders to give bulbs a good start. Lift half-hardy, flowering plants such as begonias, dahlias and cannas as soon as their foliage is blackened by frost and move them to a frost-proof store if not already done. You can plant herbaceous perennials if your soil is not too heavy or wet. If it is, it may be better to wait until spring. Plant up spring bedding once borders are cleared. Autumn planting of trees and shrubs is less stressful for the plants so you can prepare sites fruit and deciduous trees, and new rose beds, in October, to give the ground a few weeks to settle. Then plant later in the month and into November. Take hardwood cuttings from shrubby plants to grow in sandy soil in a sheltered area where they can grow until you move them to permanent quarters in autumn next year.